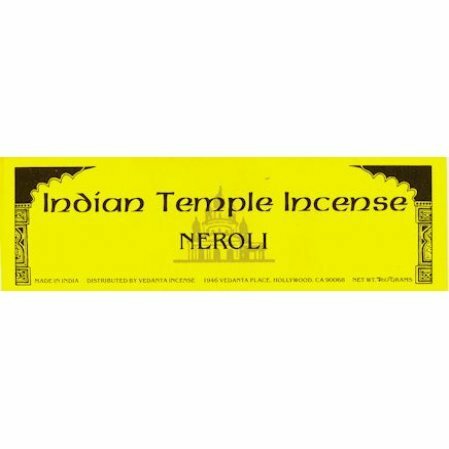 Neroli incense is made from a plant oil that comes from blossoms of the bitter orange tree (citrus aurantium, subsp.amar or Bigardia). Neroli incense is made from a plant oil that comes from blossoms of the bitter orange tree (citrus aurantium subsp.amar or Bigardia). This fragrance is part of our Indian Temple Incense brand. Please note that we may have to send the incense separately from any books ordered. If we can, we'll ship the incense with your book order, and charge the first class mail charge for the incense. Otherwise, the incense will be send separately by UPS or priority mail. In this case,you will pay more than the estimated shipping charge. I am always happy with the incense that I purchase from you. It is one of my preferred smells. It is floral and not sweet. Strong smell that lasts for hours in the environment.